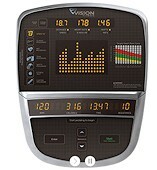 The Vision Fitness S60 Elliptical Trainer is On Sale! Vision Fitness offers three suspension elliptical trainers. We find the design, engineering and quality to be second to none in the industry. Although all their ellipticals are commercial grade, the two sold for both residential and commercial environments are the Vision Fitness S60 and the Vision Fitness S70. Why would you want to purchase a commercial grade elliptical trainer for your home? Because you want the very best in durability and ergonomics. The Vision Fitness S60 definitely qualifies in those two categories. However, it lacks one feature that could be a deal breaker for potential customers. The vast majority of elliptical trainers come with the ability incline the elliptical motion. By inclining the motion you increase the intensity of the workout and you are able to target more lower body muscles, which we find appealing. That said, there are customers who just want the ability to adjust the intensity of their workout through resistance. And in fact, Precor has a couple of models without an incline feature, and we are told they are popular sellers. WEEKEND SALE ENDS MONDAY: The Vision S7100 is ON SALE for $3,199 and they are throwing in FREE Shipping. Perfect Stride Motion – The Perfect Stride Motion are exclusive elliptical design features found only on Vision Fitness elliptical trainers. It consists of a series of biomechanical and ergonomic features designed to give the most rewarding crosstrainer workout. In a nutshell the Perfect Stride offers a very natural motion, like running in the air. The S60 comes with a very heavy flywheel that ads to the natural feel of the motion. In addition, the pedals are placed only 2” apart to minimize strain to your hip joints, and the unique suspension design makes it easy to mount and dismount the machine. We can personally state that the motion and the stride are far superior to what you will find on residential elliptical trainers in the sub $2,000 range. 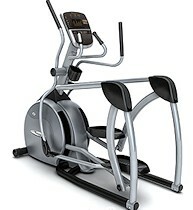 The feel of the Vision Fitness S60 elliptical is similar to the machines you experience in a health club. 21” Stride Length – The typical stride length on moderate to high end residential ellipticals is 20”. The extra inch adds to a more fluid motion. LED Console – The console is fairly standard, but it does allow you to monitor numerous stats at once with five window displays. Heavy Unit Weight – The Vision Fitness S60 is a very heavy machine at 345 lbs. Stability and vibration is not an issue. In fact, it is warranted for users up to 400 lbs. Non Electrical – The S60 does not require electricity. So be aware that it does not turn on until you start the motion. The advantage is the S60 does not need to be placed near an outlet. Installed Programs – You get a generous selection of installed program – 21 total. In addition to the most popular, you get heart rate control programs that base your exertion on your targeted heart rate. This method of cardio exercise is popular with professional athletes. Note that the wireless heart rate strap is extra, but they are inexpensive. Sprint 8 – Sprint 8 is an exclusive program only found on Vision Fitness treadmills and elliptical trainers. The program was created by a professional fitness trainer and has been scientifically tested to provide the maximum results in the minimal amount of time. Basically it is an interval program on steroids. It is 20 minutes long and alternates between short high resistance workouts and periods of recovery. The company claims some users have lost 27% of their body fat in just eight weeks. We personally cannot verify the effectiveness of Sprint 8, but in talking to one of their employees, he swore by it and said he was a devotee. Warranty – The Vision Fitness S60 Suspension elliptical is warranted for either residential or commercial use. The residential warranty is particularly generous with a 7 year parts coverage, which is above average, and implies that the components are heavy duty. You also get 2 years labor. We personally would not purchase the Vision Fitness S60 because we would not consider an elliptical without the incline feature and would opt for our “Best Buy” choice the Vision Fitness S7100 instead. But there are users who do not care about inclining the motion and want to adjust their workouts strictly through the resistance. If you fit that profile and want a commercial grade elliptical for the home, then the S60 is a very smart choice, in addition to the fact that you save money not having the incline feature. The Vision Fitness S60 provides a very rewarding crosstraining workout, is extremely durable and is rock solid. And it should be noted that the parent company, Johnson Fitness, offers some of the best customer service in the industry.